Our tips will help you to provide proper sugar glider care for your new pet. Before taking on the responsibility of caring for this pet, ask yourself first if you are willing to commit to 8 to 15 years of care for the sugar gliders. If you are, then care or making sure that they are safe and healthy in your care will be a breeze. As small pets need extra special attention by keeping them warm. Make sure that their cage is kept at a temperature of 75 to 80 degrees Fahrenheit. The Association of Sugar Gliders Veterinarians recommends using heat rocks and heat lamps to achieve this temperature requirement. It is necessary to keep baby sugar gliders warm because their small bodies are not able to generate the heat they need to sustain them while they are still babies. Sugar glider babies or joeys usually are tucked inside their mother’s pouch while still young. Having the heat rocks at a corner of the cage keeps them warm and helps them grow healthy. Part of making sure that your pets are healthy is making sure that they have the right cage to live in. The standard cage design and materials used to house this pets are 2x2x2 feet plastic PVC wire mesh cage wherein the distance between the wire mesh should not exceed half an inch so that they cannot get out of their cage. Since they are very active animals and like jumping, climbing, and running around their cage, a tall construction is more important than a wide cage. More toys and accessories to climb on and jump around in the cage is great sugar glider care. Active and happy sugar gliders are healthy pets. Regarding food. Make sure pets are kept hydrated and well fed. This pets are omnivores – they eat both meat and greens. In the wild, they feed on insects and eucalyptus leaves, fruits and vegetables. They do so as well while in captivity. To make sure that they don’t get dehydrated, having fruits in their cage ensures they have the right amount of fluid intake. Some vets may even recommend mixing water and Gatorade together for a more nutritious drink. If they don’t like the combination, try Pedialite, a nutritional supplement for babies that is good for adult pets as well. Also try Apple juice. Most of this pets, babies and adults alike, love apple juice. Part of pet care is making them stay away from too much nuts. They develop compaction, a kind of indigestion, when they eat too much of it. The one food that this pets should NEVER be given is chocolate. It is extremely dangerous for them. Avoid exposure and contact. 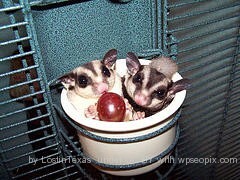 This pets are very social animals and they love the company of other sugar gliders and the company of people as well. This is why this animals are always bought as a pair or a colony. They thrive off each other as they have very fun loving and playful natures. Part of pets care is bonding with the owner. So spend time with your little babies at least two hours every day. The bonding time is necessary to get familiar and comfortable with the people around them. The right food, tons of liquid intake, comfortable living quarters, toys to play with, lots of company with other pets and bonding time with their owners are necessary sugar glider care instructions that lengthen the life span of any pet because they are kept safe, healthy and happy.